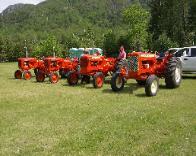 Do you know who owns these tractors? I’ve got a bunch of pictures from some past shows. I thought it might be fun to try and match the owner with the engine. The only hint I can give is the show, and the year of the show. If you know who owns the engines, please reply! Pass a link on to anyone you think might be able to help match the engine to the owner!